Massive Lake Hartwell, which sits on the South Carolina-Georgia border, will host its first Bassmaster Elite Series regular-season event this week. 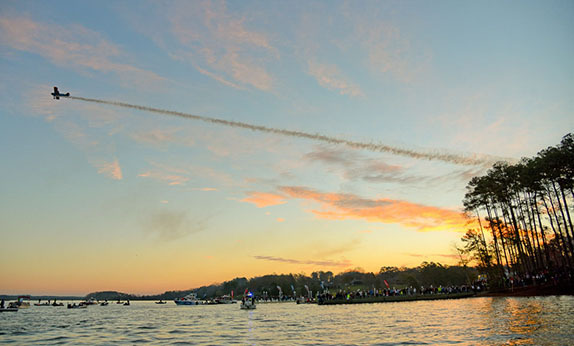 South Carolina's Lake Hartwell has been a popular top-level tournament destination over the past decade-plus as it's been the site of three Bassmaster Classics and four FLW Tour events since 2008. This week, it plays host to a Bassmaster Elite Series regular-season event for the first time. The tournament will take place a bit further along on the calendar than those past derbies, which were all held in either February or March. It's been a chilly winter in the region, however, and the bass are reportedly a little behind schedule in their annual progression though the spawning stages. A lot of them are on the beds right now, but their ranks don't include a tremendous number of big females, which might prevent the tournament from becoming a full-blown sight-fishing affair. No one on the current Elite Series roster, which is greatly revamped this year due to the defection of 68 competitors to the Major League Fishing Bass Pro Tour, has won a tour-level event at Hartwell � six of those anglers now fish the BPT and John Cox remains a stalwart on the FLW Tour. There were some high finishes by present Elites in the FLW tournaments, however. Clark Wendlandt was 2nd, Jeff Gustafson 4th and Cory Johnston 8th in the Tour event won by Cox in 2016. Clent Davis was 3rd in 2014; Micah Frazier was 2nd, Todd Auten 4th and Jay Yelas 6th in 2012; and Stetson Blaylock was 9th in 2011. Before delving deeper into bite at Hartwell, here's some intel on the fishery itself. > Reputation: An expansive, quality fishery with excellent average size, but unpredictable from spring through summer because fish move a lot day-to-day in relation to baitfish. Contains some good-size spotted bass. > Weather: A mix of sun, clouds and rain with daily high temperatures in the 60s and 70s. > Water visibility/color: Mostly clear, especially on lower end, with some stain in a few creeks. > Biggest factors: The spawn � a shallow push by a bunch of big females could make for an interesting weekend. > Biggest decision: Where to start � there are bites to be had in many places. > Wildcard: Sight-fishing � stumbling across a big one that's visible and ready to bite could provide an angler with a huge upgrade. Trad Whaley, a Hartwell lifer who boasts two BFL victories on the lake, says whoever wins this week will have to do more than sight-fish. Clifford Pirch caught some deep-dwelling fish in practice, but he's not sure they'll still be there when the tournament gets under way. "If guys see a good one they'll stop on it, but the ones you can see are only good for about 13 to 15 pounds a day," he said. "They're everywhere, but not many big 'uns. "You can catch fish about any way you want to at a lot of different depths out to 25 feet. Docks are going to be a big deal and you'll probably see some good fish caught on bigger swimbaits. I expect the West Coast guys to do well." He doesn't see the event being won far up either of the rivers (Seneca or Tugaloo) because the higher-than-normal water gives fish too many places to hide. The clear to moderately-stained water close to the main lake should be the most productive. The nomadic blueback herring, which bass are less obsessed with during the spawn than at other times of the year, could still play a role. The herring are on the verge of their own reproduction periods and could be ganged up in specific places. "You'll have (bass) coming in and going out (of the spawning pockets) and they'll stop on the herring places like the secondary points. Somebody could catch some big ones jerking out on the points. The wind will play a big role." He said it should take an average of about 16 pounds per day to challenge for the win and such bags will be comprised almost exclusively of largemouths. "If it is a mixed bag, it's going to have to have the magnums (spotted bass 4 pounds or bigger), and this lake isn't known for those like Lanier is." 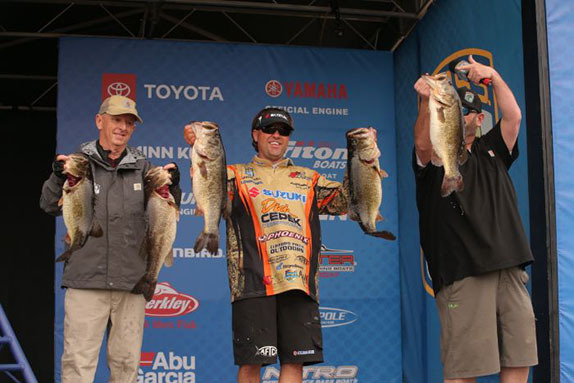 Following are practice notes from a few of the anglers who'll compete this week. "Practice started out pretty good with the weather in the upper 70s, then we started getting down into the 30s every night and that slowed things down a bit. Now it's warm again and I think the fishing should get pretty good again. "The thing about Hartwell, the fish just roam all the time and they never seem to stop swimming. Every day they're somewhere different and you just have to go fishing and find them that day. There will be some bedding fish and a lot of other things going on. It's April, so it should be prime time. "The good thing about this place is it's big. With only 75 (anglers), you can go all day and only see a couple of other boats." "I think what we're seeing is just a bunch of major changes that are going to make things drastically different than what they have been. It was cold for awhile and back and forth frontal, and all of a sudden it's going to be nice for 4 or 5 days in a row. We're probably looking at a whole different set of conditions. A lot of fish could go from schooled up and biting offshore to spread out on the bank pretty quickly. "I've got some shallow fish I think I can catch and some deep ones I think I can catch. I'm just going to roll with how it develops over the next couple of days. I don't know how long those deep ones will stay there. I'm talking real deep and they may not be in a real big hurry, but it's spring today and I'm sure they've been ready to move." 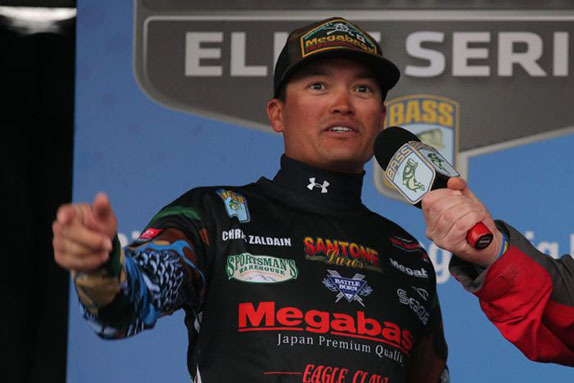 Chris Zaldain, the runner-up in the previous event at Lake Lanier, could be a big factor in the swimbait bite is on. "I looked at a lot of fish in practice, but I didn't catch much. In my opinion, you're just going to have to run a lot of water. I wish I would've found more of a pattern, but I didn't do that. I'm just going to have to move around a lot and hope I run into five decent ones. "I think sight-fishing could play a big role all 4 days. They're just going to keep coming." "This is one of my favorite lakes and one of my favorite times of the year to fish, but that doesn't always translate into good results. I like this time of year because you don't have to worry if you're doing the wrong thing � the fish are coming to you. I think we're just a few warm days from it being really good. It's still a little bit tricky; there's definitely a lot of fish shallow, but it's still hard to get the quality bites. "I think you'll see some good bags (on day 1) from guys who've got five good ones spotted, but overall I don't see a giant catch. But it's 75 degrees right now (Wednesday afternoon) and tomorrow it'll be in the 70s again and it could be totally different than what we've seen in practice. It's gradually gotten better as it's warmed up. "I have a little bit of confidence only because of what I saw swimming. I don't think they'll be easy to catch and I don't even know if they'll sit down and be catchable. I'm in some areas that I don't think will get a lot of pressure and I'm hoping those fish will lock down and get aggressive. It's all based on what the big ones decide to do." Based on the current conditions, here are a few anglers who BassFan believes stand a chance to fare well this week. > Brandon Cobb � The Greenwood, S.C. resident has posted top-20 finishes in both events thus far and sits at No. 7 on the points list. A good showing on his home lake wouldn't surprise anyone. > Chris Zaldain � If larger swimbaits are a key player, the runner-up in the previous event at Lake Lanier will have a prime chance at a second straight single-digit placement. > Micah Frazier � The Georgian has been on a nice roll since last summer (his 46th-place finish in last month's Classic notwithstanding) performed well at Hartwell on more than one occasion during his FLW Tour days. > Drew Benton � If some big females arrive on the beds due to the warmer weather and impending new moon, he could be in business, as the Floridian is a sight-fishing ace. Anglers will launch at 7 a.m. ET each day from Green Pond Landing and Event Center in Anderson, S.C. Weigh-ins will start at 3:15 p.m. in the same location.